The Mesa Harmony Garden is a 501(c)3 foundation, located on the property of the Archdiocese of Los Angeles, Holy Cross Parish; for no purpose other than to serve the local community. The Mesa Harmony Garden is an independent entity, separate from any religious or political organization, and does not receive nor contribute any funds or means directly nor indirectly from any organizations, as prescribed by the non-profit tax codes of the State of California and the Internal Revenue Service. Hugh Kelly, President, has been a board-member since August 2011, and has chaired the board since February 2014. Hugh has been volunteering at the garden from the start, and has been the volunteer coordinator for most of the intervening period. He has been writing the garden's monthly column in the Mesa Newspaper since October 2011. A certified Permaculture Designer, and a Master Gardener with the UC Cooperative Extension Service, Hugh is on the organizing committee for the Santa Barbara Food Alliance, and runs a pilot program to train and support farmers in less-developed countries to create sustainable livelihoods. Vicki Halpern, Vice-President, joined the Board as Harvest Coordinator in January 2017, and has been volunteering at the garden since October 2015. A Master Gardener with UC Cooperative Extension Service she has also studied at SB City College for her Permaculture Design Certificate. In addition, she is on the Project Board of a non-profit program to train and support family farmers in designing sustainable food systems. Vicki moved to the Mesa in 2015, after retiring from a thirty year career in social services. Randy Saake, Treasurer, is a Deacon at Holy Cross Church, and with Fr. Ludo and the Parish Council was instrumental in finding a practical and community based use, and the personnel capable of developing the land and mission which has become; the Mesa Harmony Garden. Since its inception Randy, has been involved with the development and planning of the Mesa Harmony Garden, in securing the 501(c)3 tax-exempt status, maintaining the finances, and utilizing his professional construction and building skills to make several improvements to the irrigation/water capturing systems and structures on the site. Fred Owens, Secretary, joined the Board in March 2013, and took over the duties of Secretary in May 2013. Owens is a lifelong horticulturist with experience in small farms, greenhouses and residential landscaping. Owens has worked the soil and learned the climate in California, Washington state, New England, Texas and Zimbabwe. He said, "I enjoy volunteering at Mesa Harmony Garden, it restores my enthusiasm for the work." 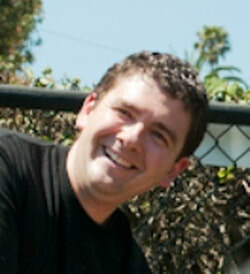 Josh Kane was the inaugural President of the board, subsequently serving as Vice President from February 2014 to July 2017. He is a resident of the Mesa, where he also works as a Financial Adviser with Edward Jones. He is Vice-President of the Mesa Business Association and a board member of the Kiwanis Club of Santa Barbara, all of which he fits in around his role as the father of two young daughters and husband to his high school sweetheart. Larry Saltzman is the garden's Permaculture Designer, and has been a member of the Board since August 2011. He specializes in Mediterranean Food Forests, and he and his wife Linda have a 20 year old Food Forest in Santa Barbara. Larry has spoken and written extensively on Food Forests, and is President of the Channel Islands chapter of the California Rare Fruit Growers. He co-founded the Santa Barbara Organic Garden Club, is past President of the Permaculture Guild of Santa Barbara, and was named a local hero by the SB Independent in 2008.